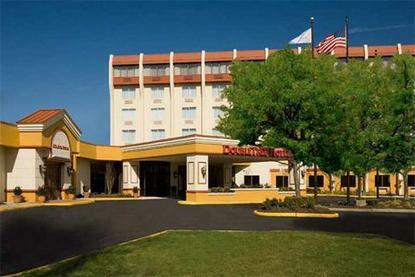 The Doubletree Hotel Princeton is conveniently located off US Hwy1 at Ridge Road near historic downtown Princeton, New Jersey, and prestigious Princeton University. Our modern, full service hotel is perfectly situated for both business and leisure travelers only 45 minutes from either Newark Liberty International Airport (EWR) to the northeast or Philadelphia International Airport (PHL) to the southwest. Our Princeton area hotel offers beautifully appointed rooms, suites, and Executive Floor accommodations with ultra-comfortable Sweet Dreams beds and wireless high speed internet access, as well as a long list of features to ensure your comfort and productivity while on the road. Maintain your exercise regimen at our heated indoor swimming pool and Fitness Center. Enjoy casual, steakhouse-style dining and beverage service at On the Bone, our full-service restaurant serving all your traditional favorites as well as small plate ''tapas'' selections, open for breakfast, lunch, and dinner daily. Or, consult our Concierge for local dining and entertainment options. We offer complimentary shuttle service to popular destinations within a five-mile radius of the Doubletree.Business travelers will appreciate our well-appointed Business Center, complimentary wireless HSIA in all common areas, and proximity to the many corporations and companies such as Wyeth, Bristol Myers Squibb, Johnson & Johnson and Novo Nordisk located in the Princeton vicinity. The Doubletree Hotel Princeton has over 8,000 square feet of versatile meeting and banquet space that can easily accommodate groups of up to 200 for corporate conferences, training workshops, seminars, or weekend groups. Or, allow our professional staff to create your perfect reception, luncheon, wedding or social event. Historic Princeton, located midway between Philadelphia and New York City, boasts arts and antiques, shopping, fine dining, and many cultural attractions in an atmosphere of small town charm. We're also a short drive from Rutgers University, Rider University, Westminster Choir College, MarketFair Mall, the New Jersey State Museum, Sovereign Bank Arena in Trenton, Sesame Place, and Six Flags Great Adventure & Wild Safari. On your next visit to the Princeton area, our friendly and helpful hotel staff looks forward to welcoming you to our upscale hotel.